You are currently browsing articles tagged IPBES. Thirty international experts met at the University of Reading recently, to help the United Nations develop better policies and practices to safeguard the world’s pollinators. 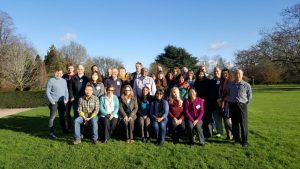 The meeting of the Intergovernmental Science-Policy Platform on Biodiversity and Ecosystem Services (IPBES) was convened to identify the greatest threats facing pollinators in different parts of the world and was hosted by Professor Simon Potts, Director of the Centre for Agri-Environmental research.